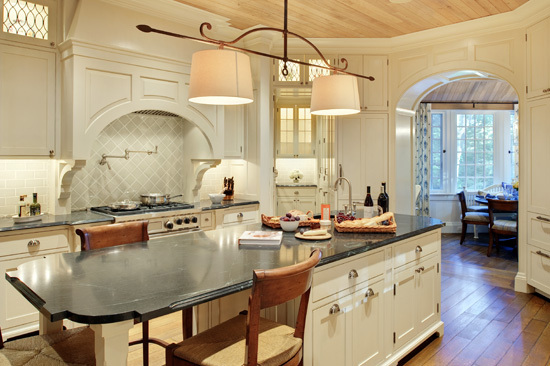 Hotel & Home portfolio spotlight: Collaborative design creates homeowners’ dream kitchen. ≈ Comments Off on Hotel & Home portfolio spotlight: Collaborative design creates homeowners’ dream kitchen. What better way to welcome you to our site, our design home, than by inviting you right into the Kitchen? The Kitchen has become the heart of the modern home. This Kitchen is particularly special to us. It not only functions beautifully for our client’s family, it showcases the wonderful result of collaboration between members of the design team. Our team, composed of both interior designers and architects, each bringing a particular area of expertise, worked together on every aspect of this space – from the overall layout to the custom cabinetry and millwork, integrated appliances, lighting, furnishings, and windows treatments down to the place settings at the breakfast table. Our system of collaboration allows us to avoid the often competing visions of the architect, interior designer, and kitchen designer. We, instead, focus on carrying through the vision of our clients for their home. Some of the major elements of this Kitchen include a 10-foot island with a seamless honed soapstone countertop, hand-scraped oak floors, and a 60-inch range with custom hood. The refrigerator and freezer flank the arched entrance to the Breakfast Nook, blending seamlessly into the custom cabinetry. Another entrance leads to a Pantry with additional workspace and storage. The quiet palette of painted cabinets and subtle tile is enlivened by a limed-oak ceiling and strategic lighting. Lighting is the often-overlooked design element that makes this such a welcoming, comfortable space. Natural lighting and minimal down lights are supplemented by a decorative island fixture, under-cabinet LEDs, and illuminated leaded-glass transom cabinets. Enjoy! We can’t wait to share more of our favorite spaces with you.